It looks the part, but is the NV100 HD's beauty only skin deep? Samsung's premium NV range packs cutting-edge features into a curvaceous, compact body topped off with electric blue highlights. Its latest addition, the Samsung NV100 HD, epitomises this style. But while it may tick all of Samsung's design boxes, it does so to the detriment of usability, putting aesthetics before practicality in nearly every respect. Such a compact footprint means there's nowhere to rest your thumb, and we found ourselves using the huge 3-inch touch panel as a thumb rest. But as this is where most of the camera's functions are controlled, it's all too easy to start unwillingly changing settings. Samsung is pushing high definition as the NV100's primary selling point, but while the requisite pixels are there to meet the 720p standard, the quality isn't anywhere near that of an HD camcorder. You'll also need the external dock (around £45) in order to connect the camera to an HDTV, as the camera uses a proprietary connector. The camera thrives in dark conditions; the pop-up flash creates natural-looking light, while the f2.8 lens allows a good amount of light in, keeping things fairly sharp. Sadly, this is about as good as it gets – image quality is poor, with heavy noise reduction, contrast tweaks and sharpening transforming every shot into a cobbled-together mash of fuzzy pixels. This is mainly due to the camera's ludicrously high pixel count; a 14MP sensor in a compact camera might wow the punters, but such a tight packing of pixels increases noise hugely. While high ISOs of 1600 and even 3200 are technically possible, anything above ISO 400 is barely usable for anything other than low-res Facebook snaps. But then, that's what this camera is about. 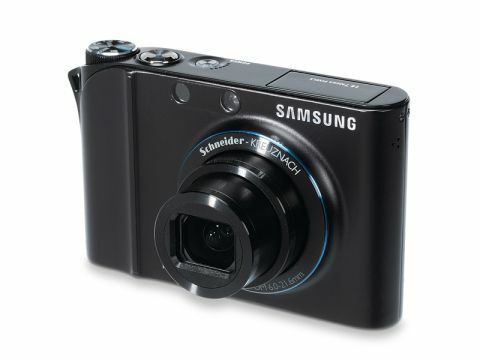 It's designed to look good on a night out and capture images to upload to social networking sites. As a photographic tool, it's lacking.